Today’s food-shopping landscape is a far cry from the humble days of the neighborhood market and farmers’ food stands. The story of modern-day food retailing is one of complexity, congestion and consolidation. It is a story about legacy retailers struggling to close a relevancy gap between what consumers expect food retailers to sell and what they desire them to sell. There can be no denying that food shopping has become increasingly complex with fundamental shifts taking place across the shopping landscape. While today’s consumers are faced with more product and brand choices, channel options and economic pressures than ever before, they are also much savvier than anytime in modern shopping history. Because of this (and many, many other factors), we believe that now is the right time for fresh thinking and an influx of inspiration on just what is going on with food shopping in America. For starters, we need to take a more holistic view of shopper behavior in the widest possible cultural context. By doing this, we begin to see, for example, that retail shopper bases are not consumer segments. When discussing emerging channels and rapid-growth retailers, it is very common (and tempting) to describe the shoppers at these niche retail banners as if they were some special tribe. It is also easy for the mind to imagine that heavy users of these niche retailers were tribally loyal to them. Yet, in reality, virtually all Americans are multichannel and multibanner food and beverage shoppers. Only a tiny percentage of shoppers buy all their food at just one retailer, be it Walmart or Whole Foods. Our notions of quality in food have evolved, such that in some categories we occasionally (or frequently) demand levels of quality we did not as a nation demand thirty years ago. What beer did you serve your BBQ guests in 1985? We don’t value all categories equally in our daily eating lives. Because the stakes vary by category, the demand for quality vs. price varies by category as well. That’s why you can meet millions of shoppers who dance between Whole Foods and Walmart, yes Walmart, every month. It is the new shopping normal. 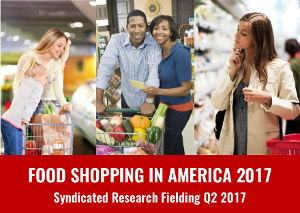 In Q2 2017, The Hartman Group will once again head into the field to launch a new syndicated research study on Food Shopping in America 2017. Food retailing is at a critical crossroads, and the game is changing — rapidly. It means that consumers are faced with any number of decisions that affect attitudes and purchase behaviors. 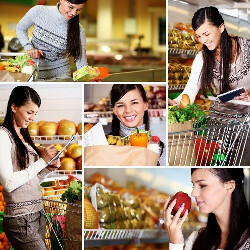 The time is now for a new understanding of food shoppers and shopping innovation. The Food Shopping in America 2017 syndicated study applies The Hartman Group’s innovative approach to answer the question: with more options than ever before, including an expanding array of online food retailers, how do consumers shop for food today? With competition for consumers’ food dollars and eating occasions so fierce, what can food and beverage retailers do to attract and retain shoppers? New to the 2017 study will be a special section on the expansion of the discount grocery channel, the emerging fresh-format channel and smaller-footprint retail formats.